This involves the ultimate purification of nitrogen (N2) from a PSA nitrogen generator or a membrane generator, by lowering the residual oxygen (O2) content to lower than one ppm. Purification of a hydrogen (H2) flow rate still containing a little oxygen to lower the oxygen content below one ppm. Recombining of the residual hydrogen (H2 ) found in the polluted nitrogen or the air, with the oxygen contained in the air, with the goal to discharge the effluent thus purified into the environment. To deal with these different cases, the DEOXO process or the Recombining process makes use of the presence of, or makes present, oxygen and hydrogen to activate the reaction of the chemical link of these two molecules in a catalytic converter to produce water. This water will then be collected or evacuated. 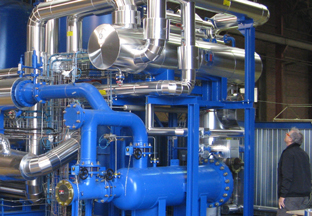 The advantage of this operation is that a nitrogen or hydrogen effluent is obtained after this treatment that is virtually free of oxygen or hydrogen (<1 ppm). Transport processes of plastic granules from petrochemical synthesis units (polyethylene). Purification of hydrogen from electrolysers before compression and filling of extremely pure high pressure bottles. Cleaning irradiated waste from the dismantling of nuclear plants, which frequently takes place in a neutral atmosphere (nitrogen N2). The CHAUMECA TECHNOLOGY Recombining units capture the low concentration of tritium (3H) found in the nitrogen to permit the discharge of this effluent (pure nitrogen N2). A CHAUMECA TECHNOLOGY DEOXO unit operates without consuming energy, except if water is used for cooling after treatment. Catalytic converters very often have more than ten years’ service life when all the precautions are taken upstream of the treatment.